Highest access of the trek: 3146m Thulo sailung. Himalayan sights: Mt. Everest, Mt.Makalu, Mt.Gaurishanker, Dorje Lakpa, Langtang Himalaya range Rolwaling Himalaya range & Annapurna Himalaya range. Splendid breathtaking place: Mt. Everest, Mt.Makalu, Mt.Gaurishanker, Dorje Lakpa, Langtang Himalaya range Rolwaling Himalaya range ,Annapurna Himalaya range and relaxing with different culture. Day 01: Arrival in kathmandu 1334m, Himalaya Journey Treks & Expedition’s representative will transfer to hotel , Sailung trekking briefing with officially arrangements. overnight at Kathmandu. Day 02: After breakfast, Drive to Mude Bazaar trek to Lamche Ahal (2300m).Overnight at tented camp. Day 03: Lamche Ahal Khola Kharka (2600m) via Thulo Sailung (3146m).Overnight at tented camp. Day 04: Khola Kharka to Doramba Gompa (2100m).Overnight at Tented Camp. Day 05: Dorama to Gurase Bhanjyang (2300m).Overnight at Tented Camp. Day 06: Gurase Bhanjyang to Kafle Damara (1100m).Overnight at Tented Camp. Day 07: Kafle Damara to Chaubas Hill (2100m).Overnight at Tented Camp. Day 08: Chaubas Hill to Bholung Village (920m).Overnight at Tented Camp. Day 09: Acclimatization day or Excursion around Bholung village .During this day you can hike in pahari village where you will see/enjoy with their tradition . overnight at Bholung village..Overnight at Tented Camp. Day 10: Bholung village to Chapkhore (1833m).Overnight at Tented Camp. 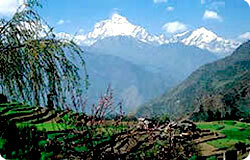 Day 11: Chapkhore visit Timal Narayanthan continue to Kot Timal (1960m).Overnight at Tented Camp. Day 12: Kot Timal Trek to Bhakunde Besi (700m) .Overnight Gunsa at Tented Camp. Day 13: Bhakunde Besi Trek to Namo Buddha (1800m).Overnight at Tented Camp. Day 14: Namo Buddha Trek to Kusha Devi (1054m) .Overnight at Tented Camp. Day 15: Kush Devi trek to Naya Gaun (1850m) .Overnight at Tented Camp. Day 16: Naya Gaun visit Phulchoki Hill (2791m) Lato Bhanjyang (1790m) .Overnight at Tented Camp . Day 17: Lato Bhanjyang trek to Godawari drive to Kathmandu O/N Hotel . Day 02: Kathmandu to Phalate Danda Overnight at tented camp. Day 03: Phalate Danda to Chaubas village 2100m.Overnight at Tented Camp. Day 04: Chubas village trek to Bholung Village 915m.Overnight at Tented Camp. Day 05: Acclimatization day or Excursion around Bholung village .During this day you can hike in pahari village where you will see/enjoy with their tradition . overnight at Bholung village. Day 06: Bholung village to Chapkhore 1833m.Overnight at Tented Camp. Day 07: Chapkhore to Kot Timal Overnight at Tented Camp. Day 08: Kot timal to Namobuddha 1967m.Overnight at Tented Camp. Day 09: Namobuddha to Walk to Panauti and take Transfer to Kathmandu. overnight at hotel. Day 10: After breakfast, our tour guide will take to for historical monuments sightseing in kathmandu valley such as Bhaktapur, Pasupatinath, Boudhhanath, Kathmandu durbar square and Monkey temple(swyambhunath) and in the evening farewell dinner in Restaurant, overnight at Kathmandu in Hotel..
Day 02: Drive to Mude Bazaar trek to Lamche Ahal (2300m).Overnight at tented camp. Day 04: Khola Kharka to Dhormba Gompa (2100m).Overnight at Tented Camp. Day 05: Dhorma to Gurase Bhanjyang (2300m).Overnight at Tented Camp. Day 06: Gurase Bhanjyang to Kafle Damara (1100m) .Overnight at Tented Camp. Day 07: Chauri Gaun to Chaubas Hill (2100m).Overnight at Tented Camp. Day 09: Acclimatization day or Excursion around Bholung village .During this day you can hike in pahari village where you will see/enjoy with their tradition . overnight at Bholung. Day 11: Chapkhore visit Timal Narayanthan continue to Kottimal (1960m).Overnight at Tented Camp. Day 12: Kot Timal Trek to Bhakunde Besi (700m) at Tented Camp. Day 14: Namobuddha to Walk to Panauti and take Transfer to Kathmandu. Overnight at Hotel.